I changed the title of this thread because I figured everyone's tired of dual disc threads, and this winter project has a wider scope than just that, anyways. I'm getting ready to start on my 400 as soon as I finish up this CL175 that I've been working on. The engine is out and i'm currently debating going down to the frame for paint. I thought I was was goingg to rebuild with new cases but for now I think I'm going to start with a head gasket. I will also be getting another 400 that I found for a good deal down in Portland. Not as clean but it has a dry engine with about 8,000 miles. 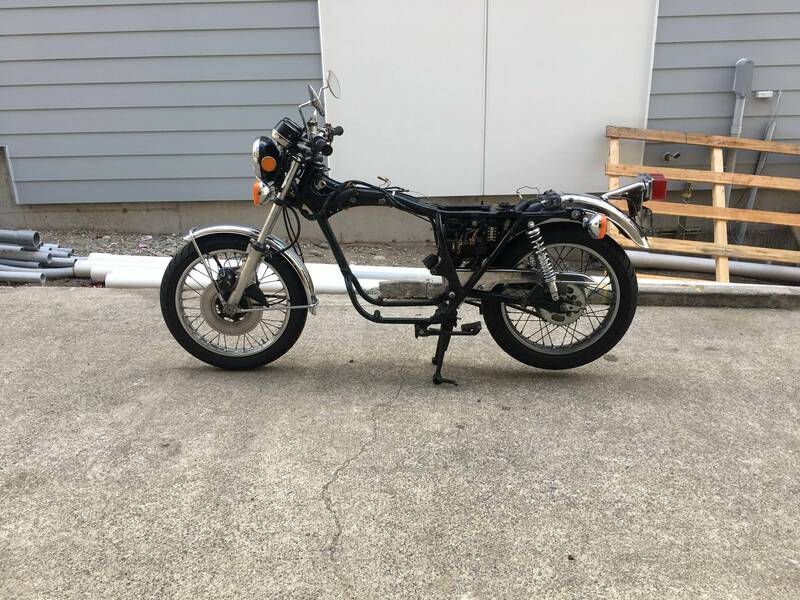 I'm debating swapping the dry engine into the nicer bike. 1. 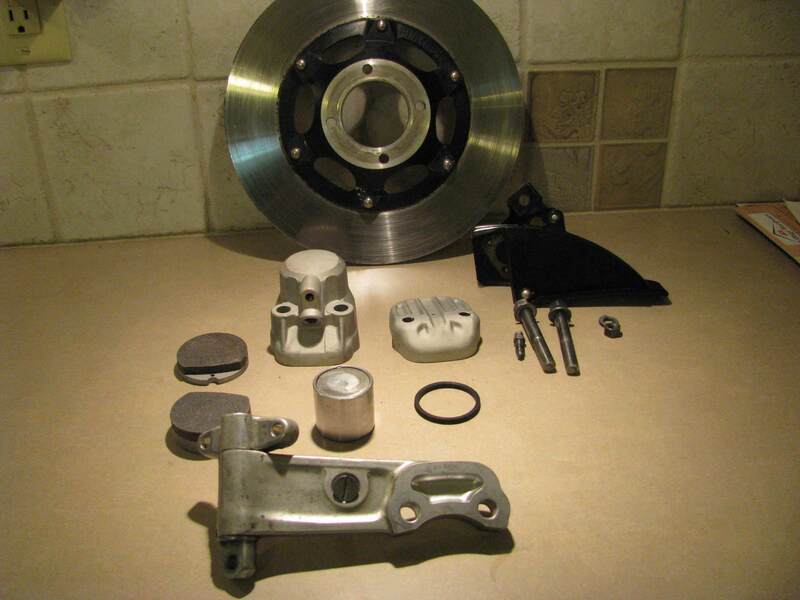 Mike in NY says he's got all the brake parts I need as well as a fork lower for $150. This seems like a fair deal to me considering most nice calipers on ebay ask $100 and I'm getting all the small bits too. I've read that most people go to a GL master cylinder for a dual disc swap, is that because the piston diameter is larger? Those seem to go for $60+ on ebay in nice condition. What if I had only one disc but upgraded my lines to stainless and went to an MC with a larger piston? Would that improve grab a bit? 2. Next I've found a fork seal and dust cover set from 4into1 tha's cheap. Normally I would get Honda parts but 4into1 always seems to be high quality. 3. RT emulators, I have read a ton about them here and it seems like those are the best to get and use with straight rate springs. I've also read that you can use the stock springs because the ~3/4" difference of the emulator will act as preload on tired springs. Is this sound logic? I wouldn't want to spend $160 on emulators and not able to feel the benefit because of old springs. But I will save myself $150 on new springs if I can. 4. All Balls, seems pretty straightforward. 5. Fork brace, I would like to get a stainless "period" looking brace, but I don't want to pay $250 for a tarozzi one so we will see if anyone has any good suggestions. These are light bikes compared to their bigger 550/750 brothers. Im a huge fan of dual disc, and with that in mind, I would keep this one single disc. Find a bit bigger diameter disc and adapt a better caliper (AP Racing, Spondon, Grimeca) and enjoy much improved braking without adding a lot of front end weight to what is a currently a very nimble machine. I do find the braking to be a bit soft (with recent master rebuild but no upgraded lines yet). I wanted to improve the braking but keep the stock/period parts, at first I considered the 450 triple/550 forks, but I don't want to lose the stock look.. anyways I thought this would be a fun challenge with unique results. Do you think the added weight will have a noticeable negative affect worse than keeping it stock? I also considered mildly drilling the rotors. A lot depends on the fork lower you've been offered... is it a right-side 400f one with the caliper mount too? That's a very rare RSC part, and came with different damper parts and springs. If so, I'd use that, get a modern twin disc master cylinder (sizing is going to be tricky), drill the discs and add braided lines too. It is a standard 400F left side lower. My plan was to mount it with the calipers inverted (it has been discussed in other threads here before). I found a couple users who have done it or seen it done in the past. I thought I had it all worked out, the only modification being the speedo drive plate. But I had forgotten about the need to modify the asymmetrical fender. And Kevin (a user here) says I might need to shave the lower as well which I would not know how to do. He suggests I just get a moden caliper and lines. However I did want to keep the caliper stock / in appearance. 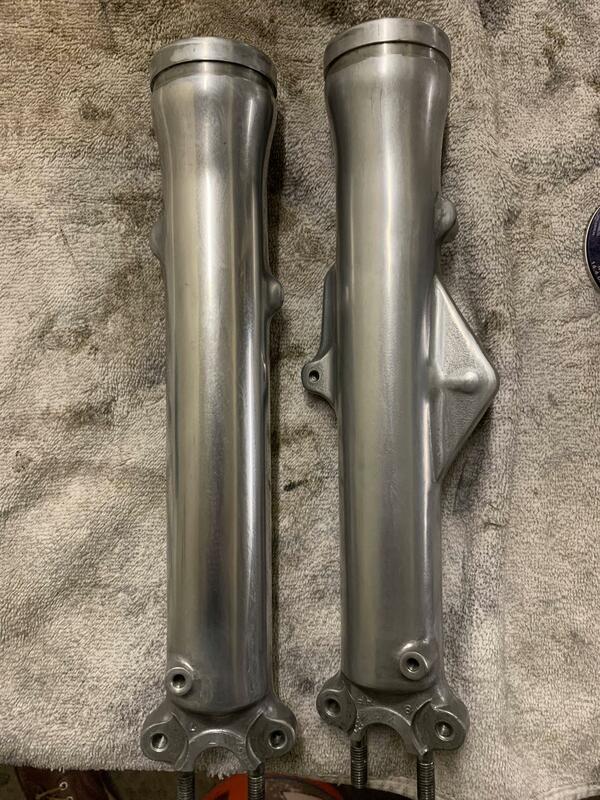 CB360 forks are the same as cb400F and cheaper but still don't have the right side brackets. I think you are overthinking it all a bit. When I got my 400 some 10 years ago (for free, the owner asked me if I wanted it or it would go to the scrapyard) I immediately decided to do with it what i previously didn't know how to, about 40 years ago, and make it FAST. And that meant it had to stop fast too, so after fixing the bike to a riding condition, it took me a week to source a caliper and disc, and the next weekend it had a double disk! I welded the mountings to the right forkleg, drilled the discs, adapted the speedo drive and used the standard mastercylinder. Of course it was an advantage that I had done this several times before on a 500, a 550 and a couple of 750's, the only real difference was the welding to the right leg. I never felt the need to do anything to the front suspension than filling it with thicker oil, the roadholding is excellent, even at the topspeed of 183km/h on my gps, some 115mph. Did you cut the caliper mounts off of another lower and weld it to your left lower? I see in the photo that you have three lowers so I assume that's how you did it. I can see how that eliminates some of the problems with my approach like the asymmetrical fender. 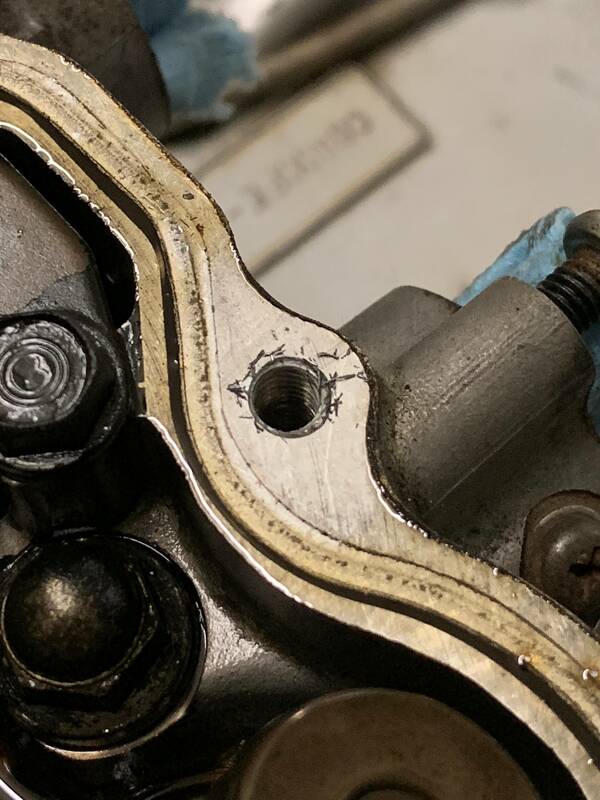 However I see you also have the small steel tube at the end of the brake line on the left side caliper, did you bend that yourself to be the inverse of the other side? No, that is a normal right forkleg, so i'm able to put it back to standard if needed. I modelled a clump of aluminium to fit. Metal brakelines can easily be bent by hand. Oh, and fender supports can easily be bent to fit properly too! That is awesome that you were able to build one like that from scratch. I'm not sure that will be an option for me though. If you did bent the fender, shave the speedo mount, and bend the steel brake line then I think that's similar to the work that would need to be done through the approach i'm proposing. Last night I decided I would paint the frame, so I went and got everything else off (except the wheels). For such a "clean bike" it's surprising the amount of greasy dirt/dust that coats everything you can't see. Right now the plan is to get the black appliance enamel paint and a new decal set for the frame. Then take the wheels off and get to sanding and degreasing. Is it ok to use carb cleaner since I'm repainting anyways? Or should I use something more tame to get ride of the grease? I'm also thinking I might need to get one of the HF ultrasonics, to clean all of the fasteners if I'm going to put them back on the nice frame. Oh, I also had a question, any tips to get the sidestand bolt off? It's so thin (and very tight). I don't want to ruin the part with a wrench trying to get it off. I can't comment on the 400f. I've used Racetech springs and gold valve emulators on my 550 and 750 (with GL front). There was a marked improvement with both bikes. [/quote]I can't comment on the 400f. I've used Racetech springs and gold valve emulators on my 550 and 750 (with GL front). There was a marked improvement with both bikes. Thanks. I am sure if I get both springs and emulators it would be the best case. That's about $350. Not bad for a big improvement but I'm just wondering if I can save $140 on the springs. I'll try and bring up the thread. I have been stalling a bit as I get distracted with romantic pursuits. My honda friend who is in his early 40's told me to focus on the girls cause the bike will still be there when I come back... Anyways I am finally taking some time tonight after work to collect my thoughts, do some research and order some parts and supplies. 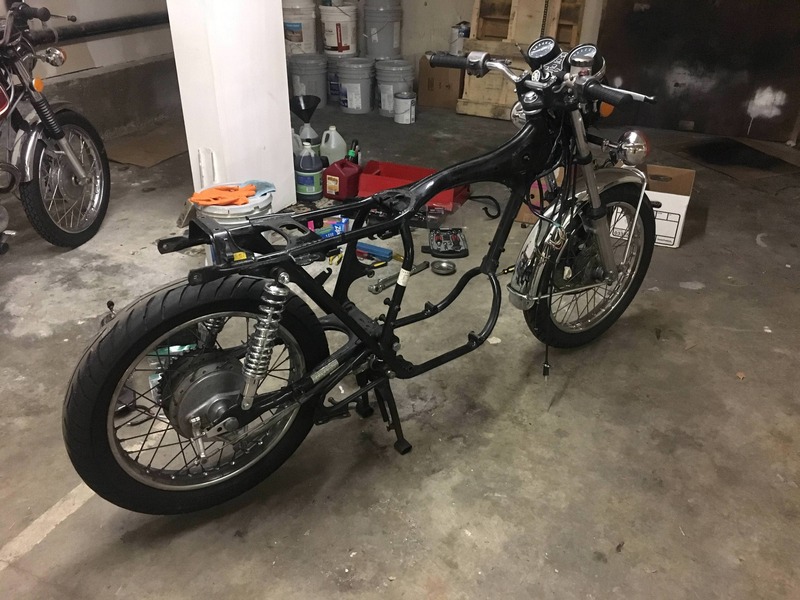 Since last posting in this thread I've got the bike all apart down to the frame. 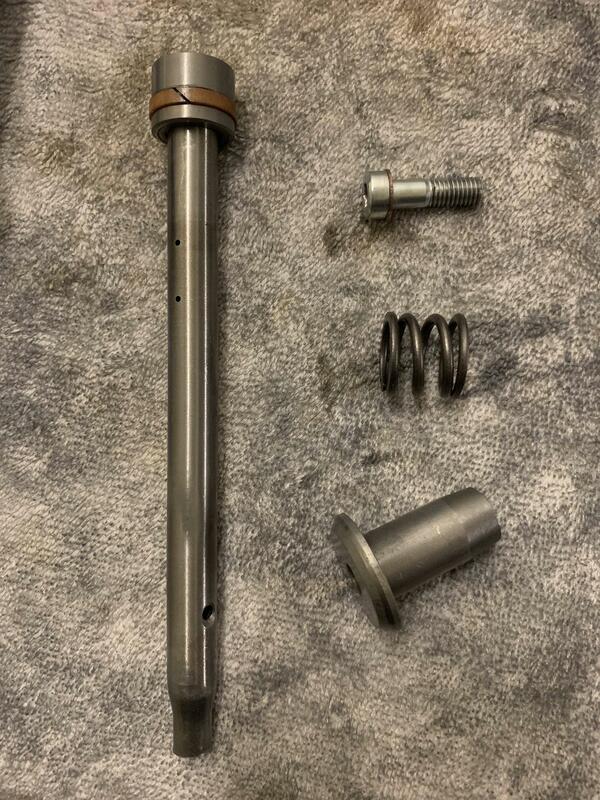 I ordered the racetech parts (with springs) and will install them after I've restored the finish of my fork lowers. I've discussed that as well as other details of the painting process in another thread here: http://forums.sohc4.net/index.php?topic=175167.0 I've ordered the paint and consolidated all of the parts which will need to be painted black. Decide what to do about my engine? Put the rest of the bike together. 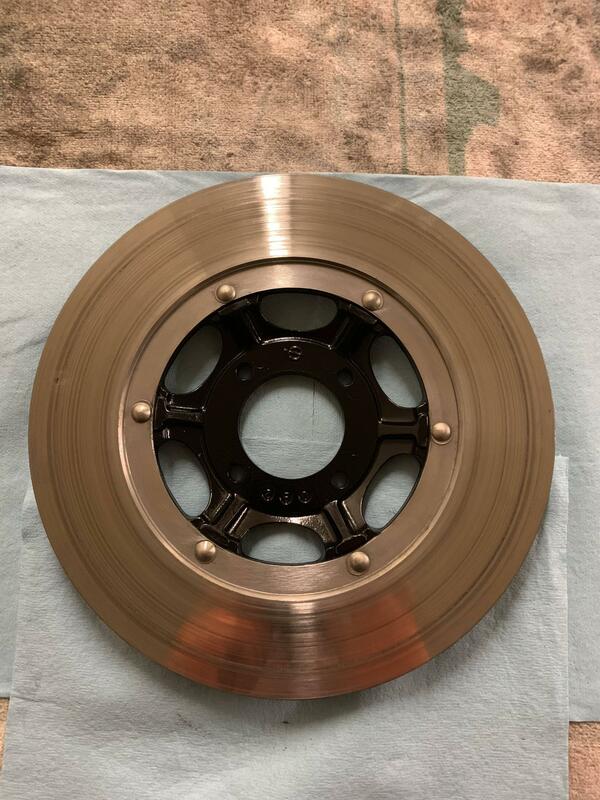 Brake Disc with the masking tape removed, right before sending to true disc. This is with rustoleum appliance epoxy black. I think it looks great. Here are the fork lowers in progress. After the are done I will Assemble the front end with the racetech parts. 600g next to 800g. I think 800 is the highest I will go. Sanded at 2k rpm. Those 350’s are nice bikes, I had a 72 for a year and had a lot of fun riding it. Post pictures if you pick it up! Unfortunately I didn't end up buying the 350. The chrome was pristine, it ran great, and the price was fair, but it looked like the tank had had a sloppy repaint, and the frame was pretty marred up in places too. 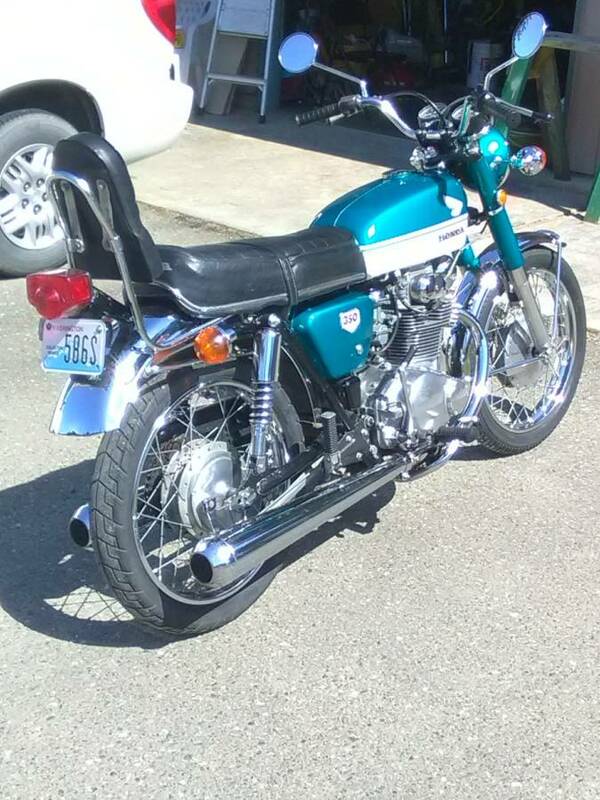 I ride a CL350 to work right now (also '70) since the 400 is apart. It's a fun bike. Working on forks today.I somehow lost one of the springs at right. Not sure how but this is the first time I've ever lost a part! I found a NOS replacement on Ebay, if I replace one do I need to replace both? I'm not really sure what it does / how important it is. 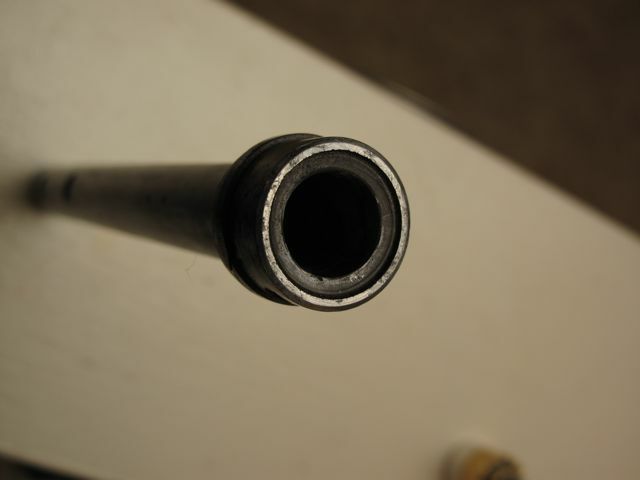 In the thread I found and linked in my previous post the poster showed this image, the roll pin removed from the damping rod. I didn't see anything about this in other threads, if it needs to be done, can anyone say how to remove it? Earlier you asked about reusing stock springs with emulators. Stock springs tend to be “progressively wound” but emulators want “straight rate” springs. So it is my understanding that you do not want to reuse stockers. Thanks Cal, I actually ordered the full set up (with new springs). I've been working on this project steadily. 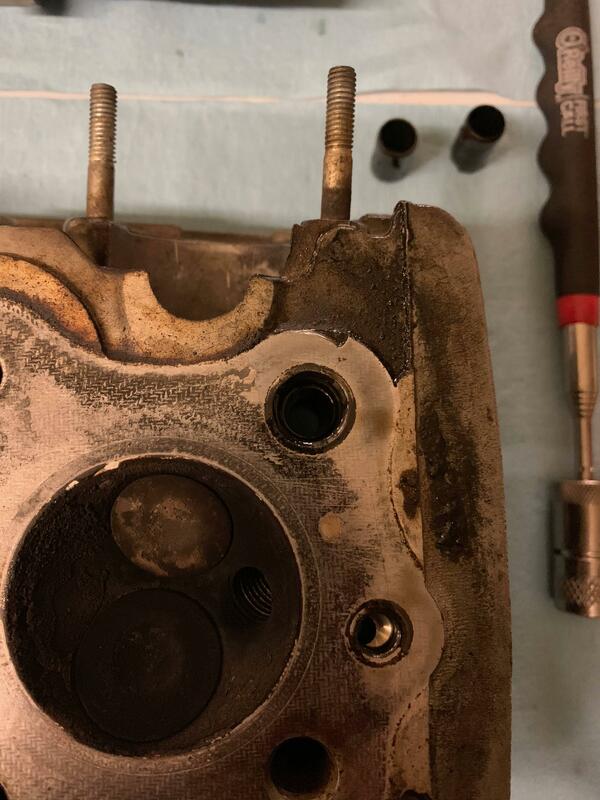 Recently acquired an ultrasonic cleaner and used it to clean the carbs, as well as pretty much every single component from the bike that would fit inside. I finished installing the racetech parts, so the front suspension is ready. I'm still waiting for the temperature to go above 50* so I can paint. I don't have heat in my garage. Once it's all painted I should be able to assemble the roller. Today I started taking down the top end. 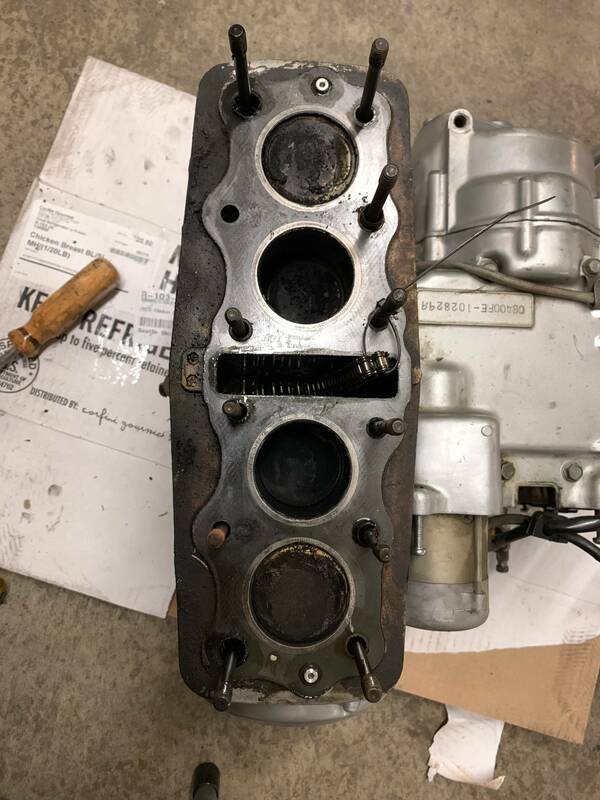 Initially I thought I was just going to do the rocker cover and cylinder head gasket, I'm now thinking I may need to take the cylinder off and replace the gasket underneath as well. 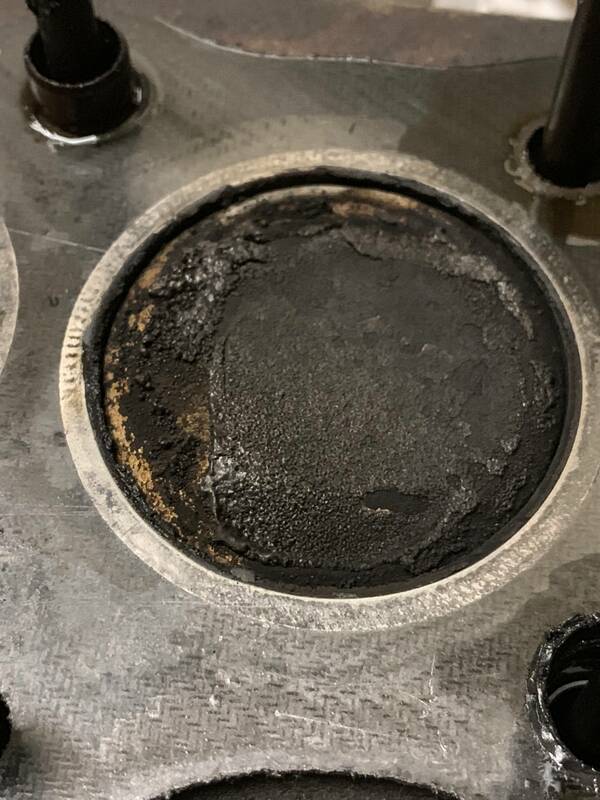 I noticed a small amount of oil/wetness at the front of the gasket. Taking off the rocker cover I noticed these metal shavings. I probably need to heli coil this threaded hole? The rubber seal here was broken, which explains why it leaked so much. 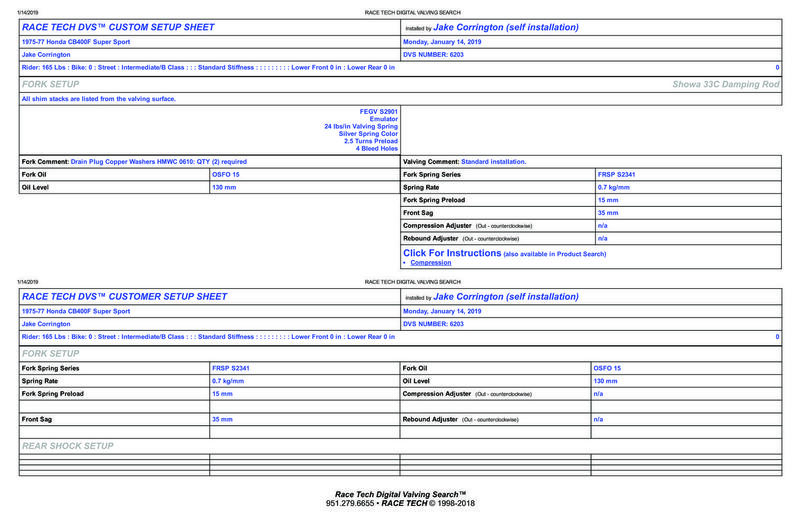 You can see wetness at all four corners of the head gasket. It was primarily leaking at the front. Here's where it was leaking the most. 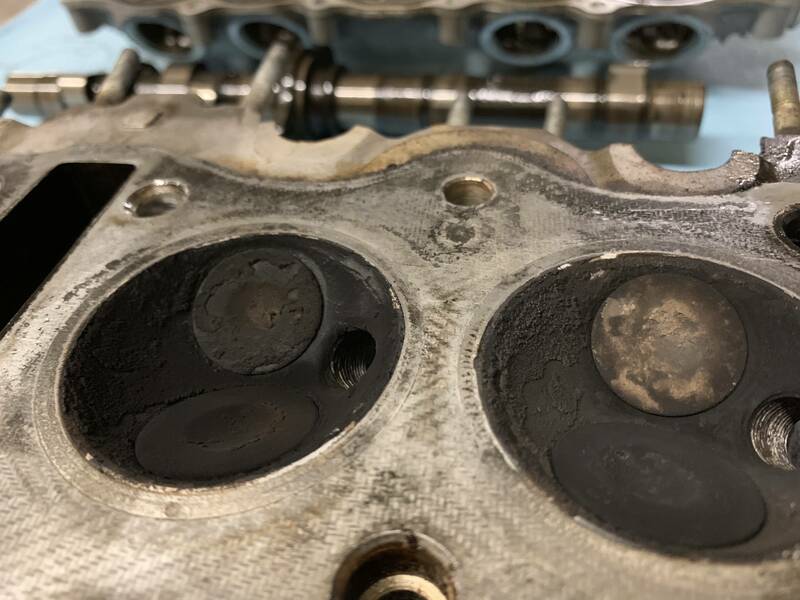 The cylinder head lacks the impression of the diamond pattern from the gasket in this area. There's also that small chip in the aluminum. I'm not sure if that's normal. Oof. How normal is this? I'm really worried about breaking a fin, the cylinder is NOT budging. I'm using a 2x4 that lets me tap all the fins at once/evenly. Even so, in the youtube series I was watching for instruction, the guy broke a fin... so I'm scared. Oh, also, I still have the kickstart attached so I was using that to turn the crank rather than the hex on the points plate. For some reason now that I have the head off I can't move the crank via kickstarter anymore. I'm holding the cam chain up so it should turn fine, but it will not. A propane torch aimed at the seam of the jugs and lower end will help release the gasket. You can’t hurt the cases, so bear down with the heat. There should be small recesses at either end that wooden wedges will drive into in order to help pry the jugs loose. I don't have a propane torch but I will give it a shot with the heat gun. I was not aware of the wedge spots until I started reading after making this post. Heat gun probably won’t get you very far, but it’s better than nothing.